Our Preschool Development program is designed to provide young children with a warm and nurturing environment to instill the necessary skills, attitudes and mannerisms for them to embrace life with an “ I can do it!” attitude. Little Dragon classes are designed for preschool aged children, 3 – 5 years of age, to help them to develop the essential physical, cognitive, emotional, social and behavioral skills that they will need to embrace life with a positive mental attitude! With each class, every child has the opportunity to earn a special skill stripe for their belt. Children who listen, follow directions and try their best will always earn their stripes. (It is important to know that children are only evaluated in comparison with their own development and not with the other children in the class.) Children must sit like a black belt (focus) in order to have a turn participating in each activity. In this way, children learn through positive reinforcement. Children are never “punished.” A child’s incentive for behaving well in class, listening and following directions is to be able to participate in the activities and earn their stripe. At a young age, we are teaching children to set goals for themselves and to work to achieve these goals. Children who earn all of their skill stripes will have an opportunity upon completion of each 8 week session to belt test to earn a new belt, signifying the next level in the Little Dragon program. For many children, this is the first time in their young lives that they are able to experience this sort of accomplishment. Children begin to believe in themselves and in doing so, develop their inner strength, confidence and self-esteem. 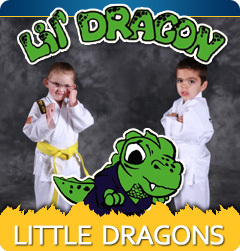 The program takes 18 months to complete all the Little Dragon belts, providing the student tests every two months. The earliest a child can begin testing is 3 years of age. Children are continuously evaluated during the 18 month program to determine early advancement to Junior program. Every child advances to the next level based on their own abilities and skills. A Little Dragons test is a time for students to demonstrate to their relatives and friends, the skills they have been learning in class and also a time for students to demonstrate to their Instructor that they are ready to move up one belt level. Students demonstrate their listening skills; attention; ability to follow directions and sit like a black belt; and proper responses to their Instructor. They will be asked to perform the techniques and skills that they learned over the course of the eight week session, at the end of the test belts are awarded.